Discover the past, present, and future of what Seattle’s wearing—and where to get it. What exemplifies Seattle fashion? Laid-back denim, practical outerwear, or innovative couture? All this and so much more can be seen every day on the streets of the city and, from May 4–October 14, at Museum of History and Industry’s (MOHAI) (860 Terry Ave N) exhibit Seattle Style: Fashion/Function. This new exhibit is separated into four sections with the themes of global sophistication, casual style, emblematic weather gear, and rule-breaking self-expression. Here you can see garments and accessories from MOHAI’s own vaults like a depression-era evening gown, technology-based knitting patterns, and original nineties flannel. If you’re inspired, read on to discover how to make a day out of Seattle’s favorite shopping spots, curated boutiques, and quirky vintage stores. Several household names originated here, some dating as far back as the 19th century. A fixture since the gold rush days of 1897, Filson (1741 First Ave S) continues to offer durable outerwear and camping clothes for men and women. 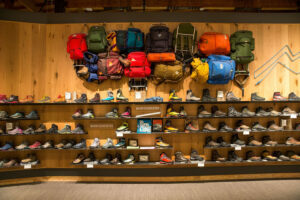 The first REI Co-op (222 Yale Ave N) started selling quality outdoor gear in 1938 and has gone on to outfit nature adventurers across the country with offerings such as waterproof jackets, durable shoes, and hundreds of other accessories. Swing by REI’s South Lake Union location to pick up the equipment you need for your next excursion or to test your new gear on the 65-foot-tall, in-store rock-climbing wall. Nordstrom (400 Pine St) is another Seattle shopping icon, having called the city home since 1901. 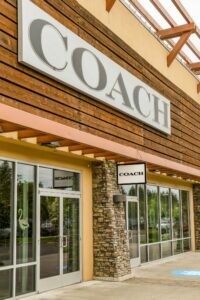 Its flagship store downtown in Westlake Center (400 Pine St) carries jaw-dropping brands at outlet prices and luxury amenities like onsite stylists and tailors, brow and nail studios, and a day spa. Make it a shopping marathon and visit nearby Saks Fifth Avenue (400 Pine St), Coach (600 Pine St, #110), Kate Spade (600 Pine St, #112), and more at retail hubs Westlake Center (400 Pine St) and Pacific Place (600 Pine St). The future of Seattle fashion is bright, with boutiques offering designer looks online and in brick-and-mortar shops. Pipe & Row (611 N 35th St) bathes shoppers in greenery and light, carrying effortlessly unique casual clothing and accessories. Baby & Company (1936 First Ave) stocks international brands for men and women with a focus on sustainability, like knitwear from Germany’s Hannes Roether or handbags from Italy’s Marsèll. One-stop shop Velouria (145 S King St) is the place to go for skincare and homeware in addition to independent designs for women and kids. For the rugged flannel-lover in your life, Division Road (536 First Ave S) simply cannot be beat. Break out of monochrome with bright colors and unique shapes at Prism (5208 Ballard Ave NW) in addition to modern homeware and head-turning fragrances like Broken Glass (jasmine, geranium, caraway) and Cowboy (honeysuckle, coffee, tobacco).